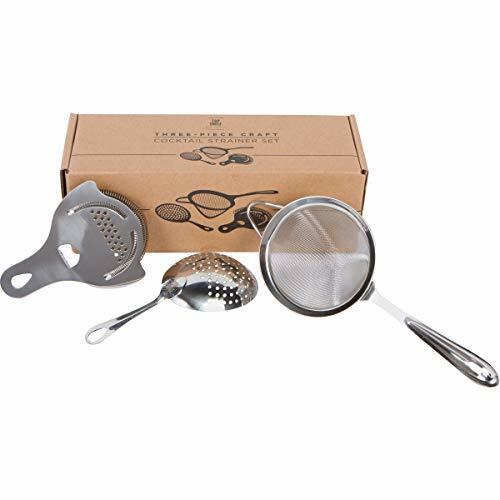 Including the three strainers every craft bartender needs, this set was designed to include the three best quality strainers available on the market. HAWTHORNE STRAINER: Our custom Hawthorne Strainer was designed from the ground up to be the most comfortable, efficient and durable strainer available. Its ergonomic shape won't rub awkwardly against your finger during service, and the finger grip is the perfect distance to minimize hand strain. JULEP STRAINER: Designed for stirred cocktails, our Julep Strainer is the perfect size and shape for your shaker o rmixing glass. Its shape is comfortable and effective for holding back the ice from your Manhattan, Old Fashioned or Martini. FINE MESH STRAINER: We were frustrated with low-quality fine strainers that damaged easily and whose handles broke off after just a few nights of service. This strainer's welds have been double-reinforced and its 10cm size is big enough to strain quickly and get your cocktails done faster - without sacrificing the quality if the strain. - Made with a polished, weld-free and food-grade SS304 Stainless Steel, these strainers will not bend, break, rust or warp. BARTENDERS CHOICE: Designed by a career bartender for working bartenders, these strainers are the most ergonomic, durable and efficient choice. Perfect for light days or deep in the weeds! DURABLE: All three strainers are made with durable SS304 and reinforced welds. Commercial dishwasher safe and guaranteed not to warp, bend, rust or break. ERGONOMIC DESIGN: Rounded handles are designed for comfort and ergonomics. We created these strainers with the busiest shift in mind, to reduce hand strain and wrist stress. Your body will thank you! VERSATILE: Armed with the Hawthorne, Julep and Fine Strainer, you'll be prepared to make any cocktail that inspires you! From Margarita to Mojito, Old Fashioned to Manhattan or Mai Tai and Martini - you're ready to mix! SPEED & STYLE: All three strainers have been created with speed in mind, but designed to ensure your drink is perfectly filtered as well. Strain with ease without slowing down service! If you have any questions about this product by Top Shelf Bar Supply, contact us by completing and submitting the form below. If you are looking for a specif part number, please include it with your message.